Update March 20, 2019 The coyote bill lost today in the NH House of Representatives. It got only 126 votes for and 200+ against. The Democrats didn’t come through for us. There are 237 Democrats in the House and the failure of this bill lies with them. We thank the 126 who voted favorably and the coyote hunters and haters thank the others who have given them permission to continue the slaughter of coyotes, even when they are nursing and raising their pups. Update March 18, 2019 Tomorrow the NH House is Voting on our Coyote bill. 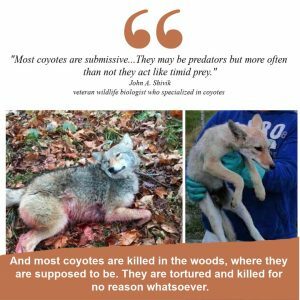 Click to see this Coyote handout Mar 19 is being given to the NH Reps tomorrow. Support HB 442, the Coyote Protection Bill! Coyotes are the only furbearer who are hunted year-round in NH. When coyotes are killed in warmer months the fur is of no value. Usually their bodies are left to rot in the woods. This is wanton waste of a resource and the NH Fish and Game Department (NHFG) and most hunters are opposed to wanton waste of a resource. Pups are born in April/May. Coyotes mate for life and both parents feed and teach the pups. We learned from the NHFG Commission that during turkey hunting in the month of May coyotes are killed. This is a time when the female quite possibly is still nursing her young. UPDATE March 4 – Our coyote bill will not be voted on in the Full House of Representatives no sooner than March 20 so please contact your Reps as soon as you can. Call them and then follow-up with an email. If enough of us contact our Reps we can get a positive outcome for coyotes. The reason closing the coyote hunting season is in the legislature is because non hunters have no voice at a Fish and Game Dept. that is run by Commissioners who are themselves first and foremost hunters. They do the bidding of their fellow hunters and it doesn’t matter how egregious the hunting activity is. Trapping, baiting, hounding, night hunting, no limits on how many animals can be killed, is all fine with the Commission. The Executive Session was held for our coyotes on February 5. The 20 member Fish and Game and Marine Resources (FGMR) committee voted 14-6 inexpedient to legislate. Not good, but not unexpected. It is Not a good committee for animals and Never has been. We still have a chance to pass the bill in the Full House of Representatives. Please contact your Representatives now and ask them to Support HB 442 by voting No on the ITL. The full house vote will be in Feb 27 so please contact them before then. Phone calls are best. If you email make sure to use your full name and address so they know you are a constituent. Longtime NH outdoors writer John Harrigan supports coyotes and HB442. Read his article – Mistreating Coyotes is Not the NH Way. FGMR Democratic Committee Members who supported our coyotes and we are grateful to have their support. 3. Hunting coyotes year-round is not a good way to manage the species. It does not control the population. Scientists have discovered that coyotes, being responsive breeders, adapt to over-hunting by having larger litters. 5. The coyote is not a food source nor is it a fur source in warmer months. Recreational killing is not an appropriate use of a wild animal. NHFG law enforcement stated at the October 2017 NHFG Commission meeting that there are laws in NH against wanton waste. It is wanton waste to kill coyotes during the months of April – September. 6. Hunting seasons for other furbearers are the same, or nearly the same, as the trapping season of that animal. Coyotes stand out as the only furbearer that doesn’t have a closed hunting season.